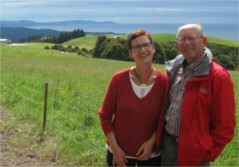 ‘My husband, Dave, and I have dreamed for many years of an extended adventure in New Zealand. Because international work provides the challenge and learning opportunities that I enjoy, the choice to seek work as a nurse in New Zealand was the first step to make our dream come true. Tonix director, Kate Nattrass was an invaluable resource as I worked through the process of gaining professional registration with the New Zealand Nursing Council, applying and interviewing for positions, and then navigating the requirements of New Zealand Immigration. Kate contacted potential employers, prepared me for interviews, and cheerfully supported and encouraged me each step of the way. Her contacts within the immigration system kept us updated on the status of our visas, and assisted when the process got slowed down between international offices. I can highly recommend Tonix to anyone seeking a health care position in New Zealand’.